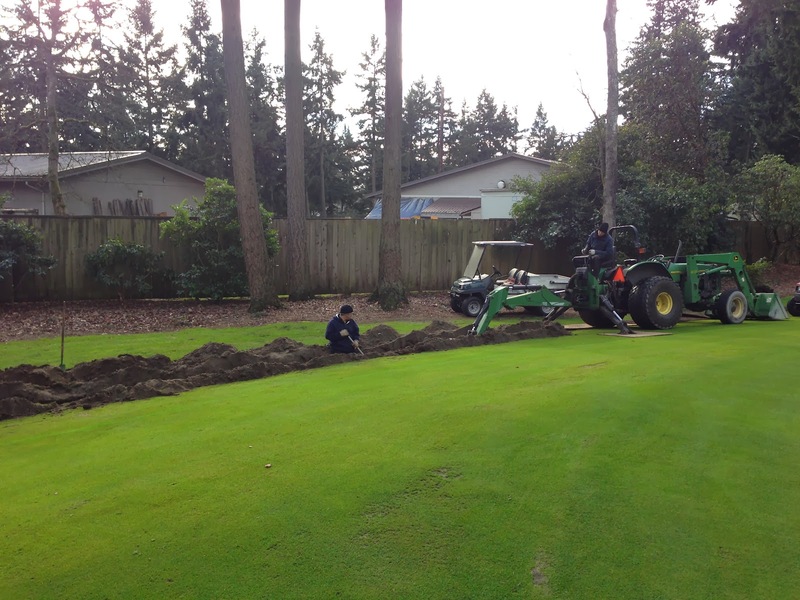 TacomaTurf: Just Get'n it Done! 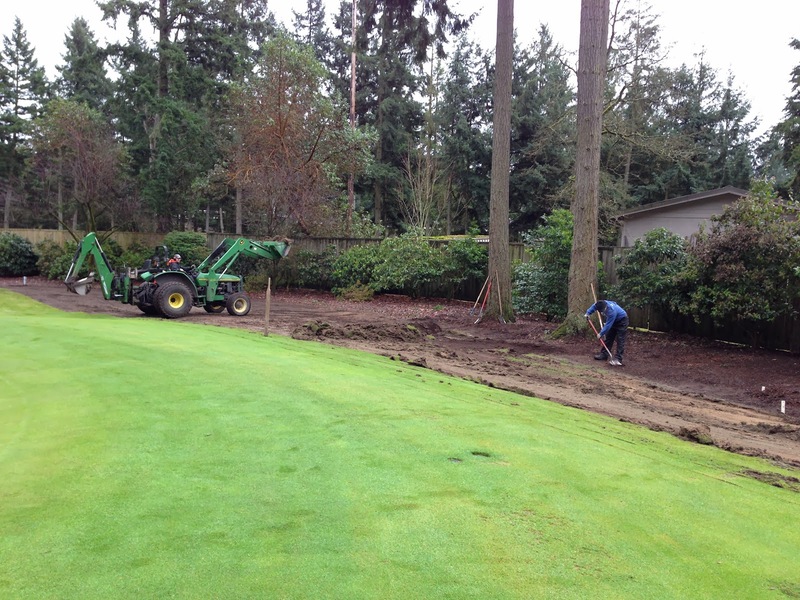 The work continues behind #2 green. The communication cable conduit is installed and now it's just time for restoration. The good news here is that we wont just be restoring the area, it will be an improvement. This area has been one of the most shady spots on the course for as long as I can remember. 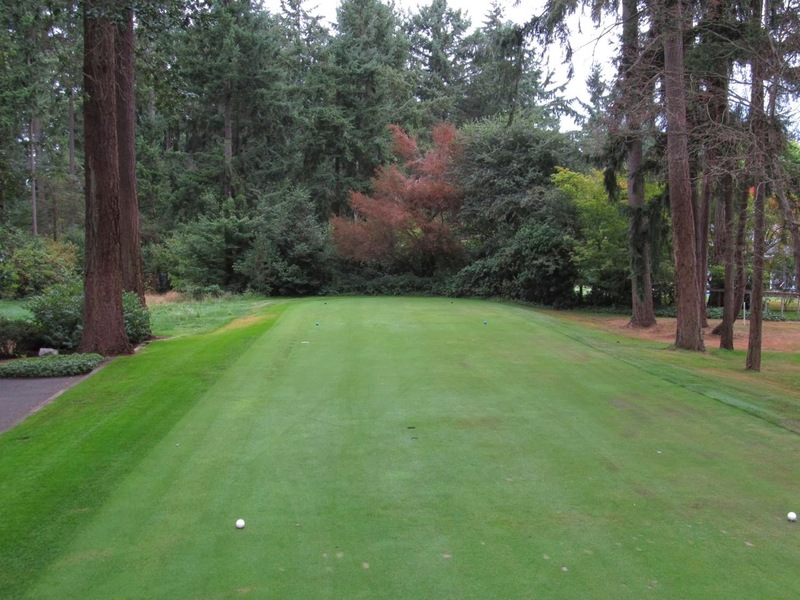 Once we began the tree management plan in 2009, things have gotten a lot better here because our goal was to increase sunlight to the putting surface which incidentally brought more light to the area behind the green. Now after the renovation which resulted in a short mowed collection area behind the green, the need for sunlight is now increased here since the expectation for quality turf has increased for this area. Once we started mowing this area as short fairway type turf this past spring, it quickly became apparent that this area would not support that type of sward without some sort of renovation. Since we have disturbed the area with the conduit installation, it seems obvious that this would be the opportune time to also renovate it as we restore it. It's really quite simple, all we are going to do is bring in 6 - 8 inches of sand so we can smooth the area and thereby cover the shallow roots that are interfering with the quality of the turf. 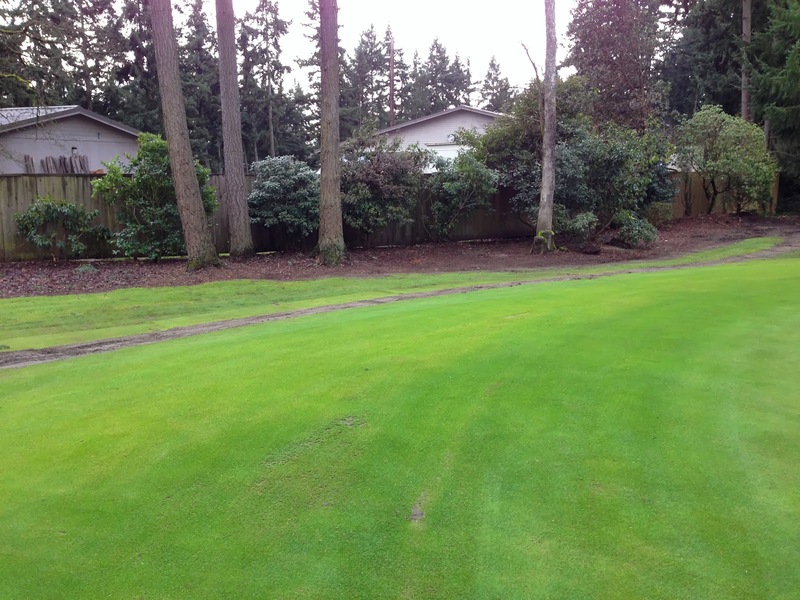 This means we will also be able to regrade the area to improve the runoff so that golf balls have a better chance to stop on turf and not run through into the garden or out of bounds. In the center of the above picture you can see the open space and the exposed fence. 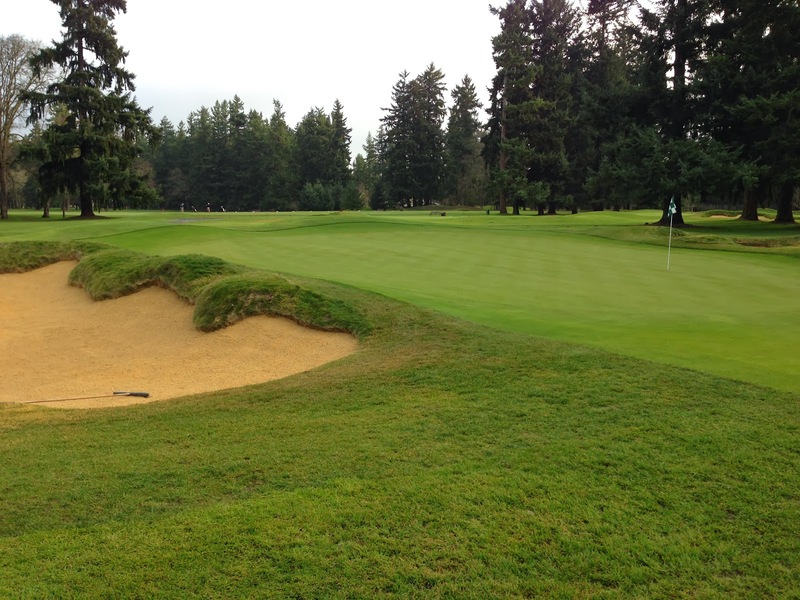 This openness in the result of removing some of the scrubby brush that was shading this area and creating a dense vegetative spot that was swallowing golf balls. 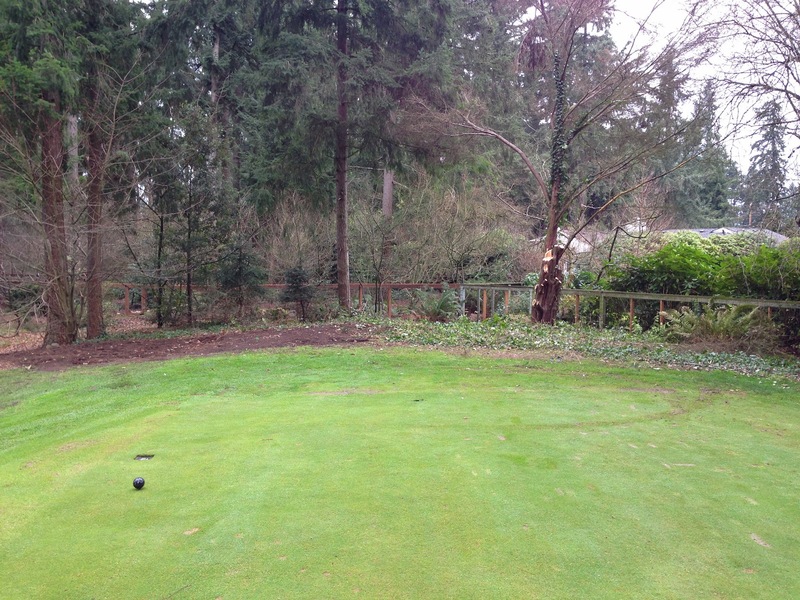 Now here is a picture of the same spot after Jeremy and Gabe transplanted some new shrubbery. This new stuff is perfect because now we can maintain them to just the right height which screens off the fence and maintenance facility without shading the turf, but it also is airy near the ground so you can find your ball or maybe even get a club on it. 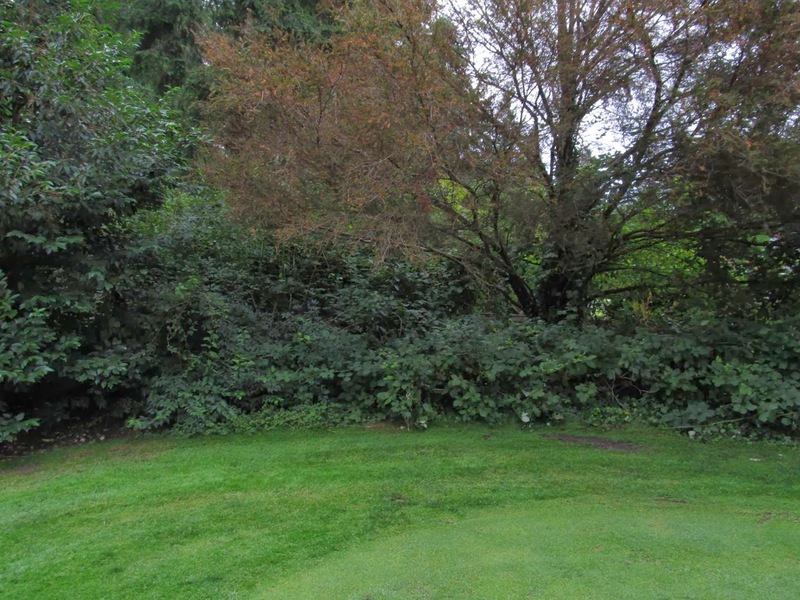 These shrubs came from the area around the second tee where have another renovation project going. The above picture of the 2nd tee was taken back in September. Check out the dead tree right in the center of the photo. That is an old native yew. I'm not sure why it passed away but right now we are working in here removing it along with some blackberry bushes and the like. Above you can see a close up of this area before we started the work. Basically it's just a bunch of native scrubby stuff that has been allowed to grow out of control so since we are in here getting out the dead yew, we might as well clean it up a little and put something in here that is native looking but yet not noxious like blackberries. Here's how it looks today during the removal phase. Incidentally, as we started digging around in here, we found evidence of the old teeing ground perimeter which we will be able to restore once we start putting this area back together. 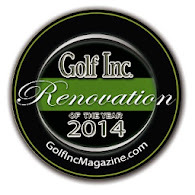 Once complete, we should be able to play the hole from 370 as it once was versus today's yardage of 360. 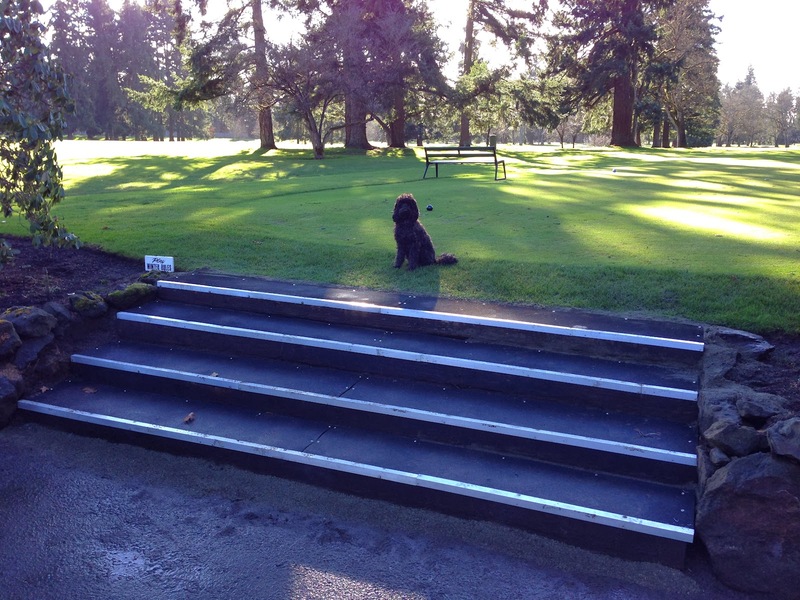 Richard was leading a group that was working on renovating the stairs to 10 tee. They turned out great. Nothing fancy here, they just took it apart, rotated the timbers so that the rotted side was down, and put it back together. I'd say they're good for at least another decade. The simple construction and materials are very functional and low maintenance. Boo say's nice work guys. It's just so nice to be getting some stuff done. When we aren't cleaning up after wind storms, we can put a lot of energy into just fixing things up. This is when we can really make a difference. It feels better working on updating or improving areas versus just cleaning up after mother nature's temper tantrums. So how's the turf??? Well considering we set several record low temperatures early this month, I'd say things are looking great. 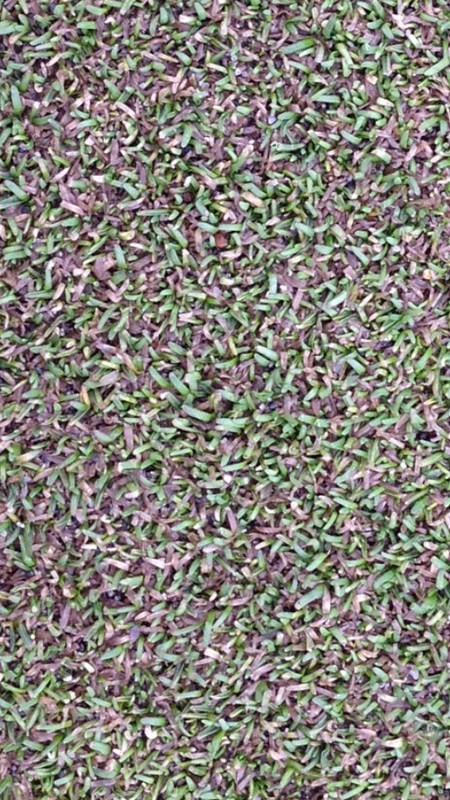 Obviously the turf looks good in this picture, but up close as in the picture below, you might think it looks a little off color. You can see that there is a lot of leaf blades that are brownish or yellow, but there is a lot of leaf blades that also green and healthy. We really came out of the deep freeze in good shape. The turf is hardened off nicely with a little growth. With turf like this we can produce some really nice winter putting surfaces. Get out there and enjoy.